This Root Tonic is an exciting technological breakthrough incorporating all the known technology from the latest research into root growth and protection in hydroponic systems. Often, because the root system is largely hidden from view, it is often a case of out of sight, out of mind. It’s easy to forget to look after the other half of the plant. How can you expect a massive crop if the root system is poor?Roots can be likened to the foundations of a building; you can’t build a huge building on small foundations and the same applies to a plant’s root system. However, unlike buildings, the roots must grow with the plant and we have uncovered secret to make them grow larger than ever before. This significant increase in root mass has resulted in the direct increase of yield every time. You often see trial results showing better yields from all kinds of products, but what you don’t see is every result from those trials; they often only post their best results but with ROOT TONIC we got bigger yields in every single trial. How does it work? Well the first step in getting any plant to build a massive root system is to protect the roots from diseases. Diseases inhibit growth and crop production. We have been able to isolate the very substances that plants themselves produce to fight disease. These substances include scavenging free radicals, oxidizing agents and elicitors that induce the plant to recognize potential invaders heightening the plant’s own natural defenses. These substances also act as the “storm troopers” of the plant’s defense system and we use them in a so Root Tonic of a “shock and awe” tactic to eliminate disease organisms before they take hold. Because they are natural products and we position them to guard against attack rather than respond to it, these disease organisms have no ready response and are immediately overwhelmed. The second secret in building a massive root system lies in the application of breakthrough root stimulation technology. It is this specific stimulation of the plant’s root production system, which induces the plant to produce a root system much larger than it normally would. A plant will send signals to the root system to grow larger; we have been able to mimic that signal. This technology works in a unique way. When a plant grows roots, the active portion of the uptake area is situated just behind the growing root tip. As the root grows, the older roots suberise, that is, they get tough and corky and they stop taking up nutrients. This suberisation helps protect the roots but doesn’t do much for root function. ROOT TONIC acts by moderating this suberisation, giving more root area for the uptake of nutrients. ROOT TONIC also induces the roots to branch much more freely thus giving a greatly increased root area. Plants respond to the increased root area by increasing the size of the above ground portion. Thus, larger roots equals larger plant equals larger crop equals mink coats and bling. If you are using a non-media system, such as NFT, you will see a root system develop like you’ve never seen before. It will be thick and pure white with a lot of branching, giving a “hairy” appearance. This indicates a greatly increased level of root growth with a whole lot more root area available to take up nutrients. In media based systems, such as coco peat, you will quickly see the roots emerging from the bottom of the pot. 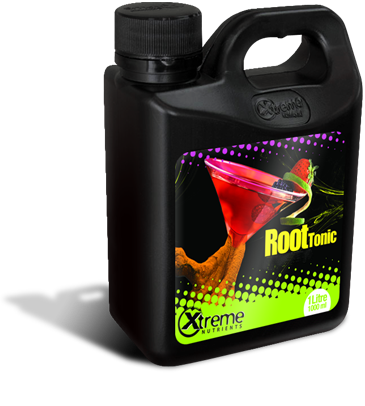 Make sure you use an adequately sized pot when you are using ROOT TONIC. We have had trials where the root systems actually SPLIT THE POTS. Yes, that’s true. Don’t underestimate the power of ROOT TONIC. The only thing to be mindful of when using ROOT TONIC in any situation is that the plants will take up more nutrient solution which means top ups or watering will be required more often than normal. When you use ROOT TONIC, you are using a product that is the result of years of research at universities and agriculture institutions and commercial RD centers around the world. ROOT TONIC is therefore the only product of its kind at the cutting edge of root protection and formation technology. The results of this research are now available to you for the first time ever in ROOT TONIC. Root Tonic should be used throughout the entire growing and flowering process at a rate of 8ml per gallon if you have a disease problem and 4ml per gallon for maintaining good health. Suitable for all hydroponics and soil plants.